Cyber security is one of the biggest challenge of this technological era. A barrage of cyber criminal activities keep occurring every single day making us more prone to threats and privacy invasion. Various malicious threats in the form of Trojans, Spyware, Phishing emails, Adware keep evolving and emerge in our lives like a nightmare. Out of all the gadgets which we use in our routine lives, our mobile phone is the one along with we spend our maximum time. An infected device is a threat to security and privacy of our phones. Hence, the prime task of concern is to keep our device safe from any malware threat or attack. Well, if you’re wondering how, then Systweak Anti Malware app for Android is the answer to all your prayers. Systweak Anti-Malware (SAM) is a one stop solution to safeguard your mobile or tablet while blocking real time malware attacks on your Android device. Let’s highlight some of its unique features in detail. As soon as you’ll launch the app, the app will welcome you with the Scan page. The Scan page displays various options like whether the database version of your device is updated or not, Real-time protections enabled or not etc. 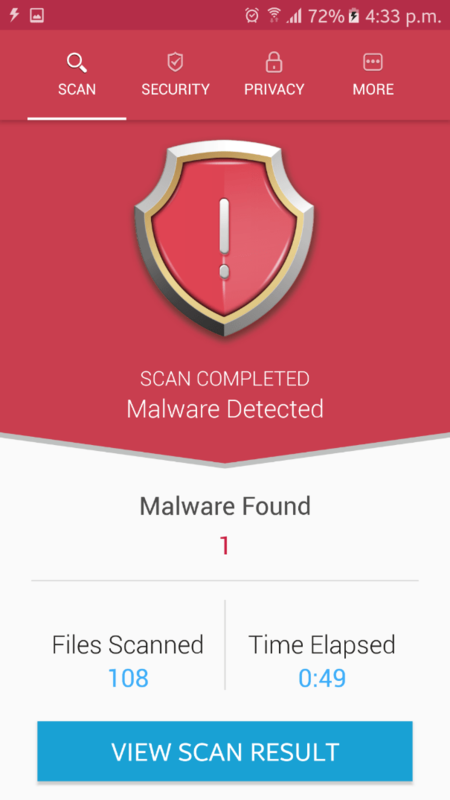 In order to scan your android device against any malicious content tap on the “Scan Now” button which is available on the bottom of the page. Once the Scanning has been performed, the results will be displayed including information like number of files scanned, time elapsed and malware found. If your Android device is 100% malware free, then you’ll be prompted with a message saying “NO Threats Detected” alongside a green colored check box. Or else if your device is infected with malware then it will display message Malware Detected with a red background. Tap on the “View Scan Result” button to proceed further. The results will display all malicious apps found on your device. You can swipe on any app to “Uninstall” or “Whitelist” the app. In Whitelist option, it will mark the affected app as Whitelisted, safe or useful for the device. Listing down any app as Whitelisted, won’t include it in any of the scan results in future. Tap on “Clean Malware” button to remove all malicious apps instantly. The next section of the app includes Security features which displays non-secure and secure settings your device. The third section of the app i.e. Privacy lists down the status of all installed applications of your device. Using this feature, you can find which app is accessing which permissions on your app. You can click on any of these apps to manage them well. In the last tab of the app all miscellaneous options such as Settings, whitelist apps, Scan History, to provide feedback etc. Settings: It allows you to customize scan options. You can enable or disable real-time protection feature here and select from Quick or Deep Scan mode. Whitelist: Includes a list of all whitelisted apps. Scan history: Displays previous scan history of the app. Share: You can share the app through various social media platforms. Feedback: To share your instant feedback about the app. About: Displays basic app information. So, if you’re looking for an app which keeps your device safe from any kind of malware attacks then Systweak Anti Malware is the perfect choice. The app is the perfect blend of advanced algorithms and powerful tools which keeps malware threats at bay. Download It now via Google Play store and keep your device safe and secure always! If you liked this guide, check our reviews about other Android cleaners, optimizer apps from here. And, that’s all for now. We will be posting more useful guides everyday. Keep visiting!